As we walked over to our butcher shop, we were already thinking burgers. Once we got there we were talking with our butcher Steve about doing different cheese stuffed burgers. 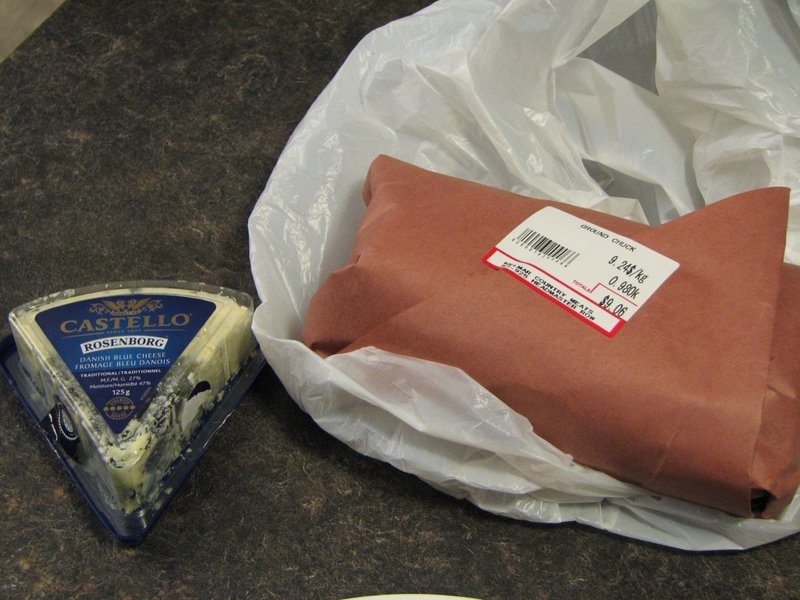 They also sell a load of different local cheeses there but I got to thinking, I have some Danish blue cheese left in the fridge I need to use, so we just bought some ground chuck roast and buns because I had a plan formulating. 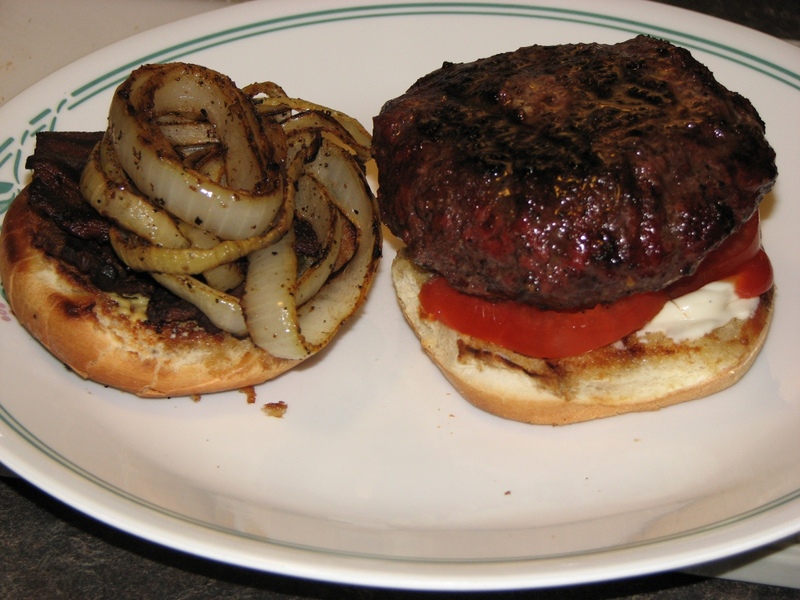 A while back we tried making a Juicy Lucy, which is when you take 2 smaller burgers and stuff them with cheese and seal up the edges. 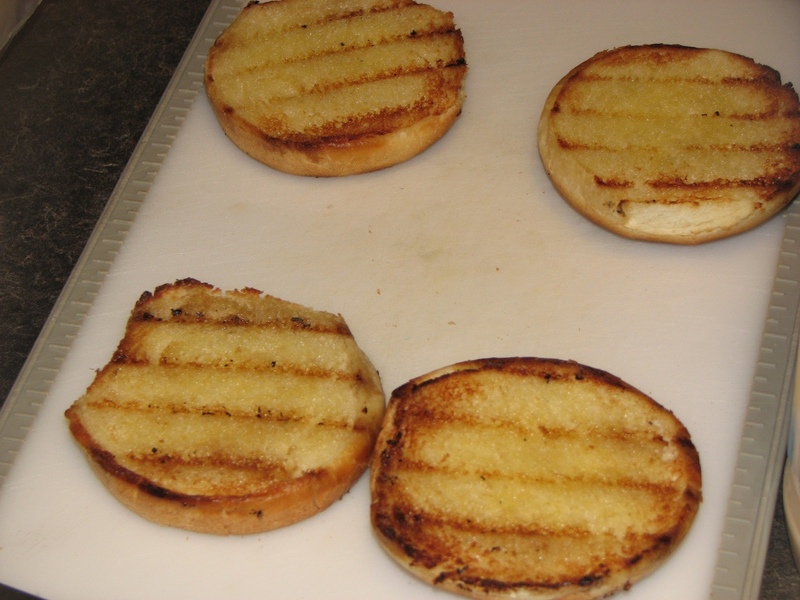 I am not sure if we even ended up posting about them because we found most of the cheese leaked out. This time I thought instead of trying to seal up 2 patties, I would make one big ball, press a hole into the middle and stuff with cheese, then I only had to seal 1 side. Worked like a charm. I got very little cheese leakage this time!!! 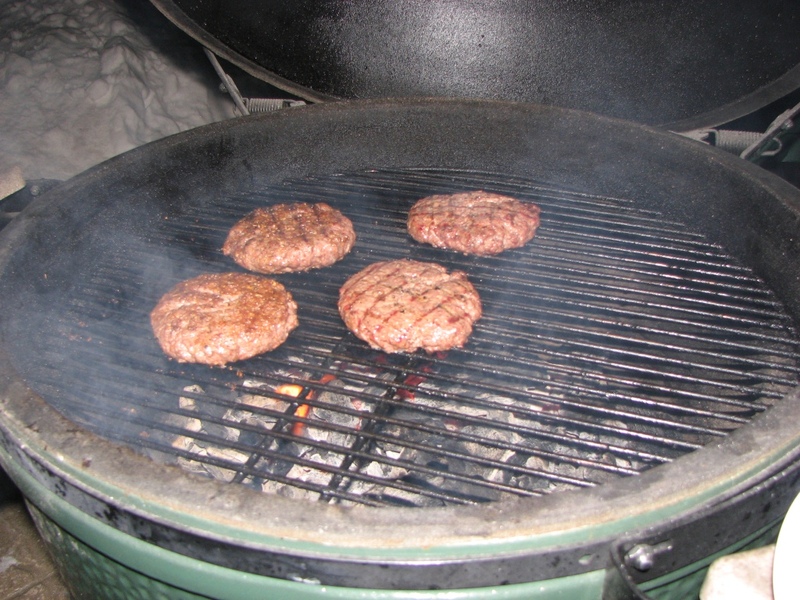 Jackie was not in the mood for blue cheese or seasoning on her burgers last night, but I hit mine with some Cluck & Squeal Beef Specific. 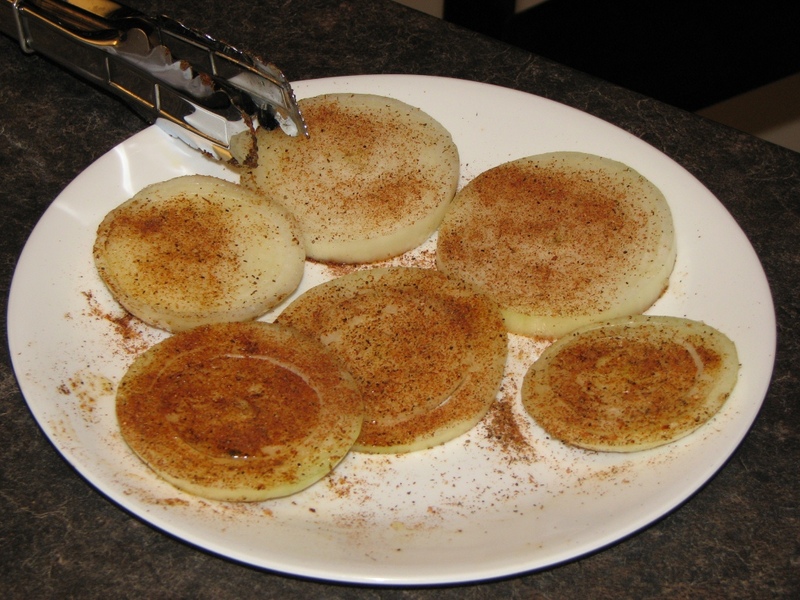 And I sliced up an onion and put a dash of olive oil and some spice rub we brought back from Hawaii on them. 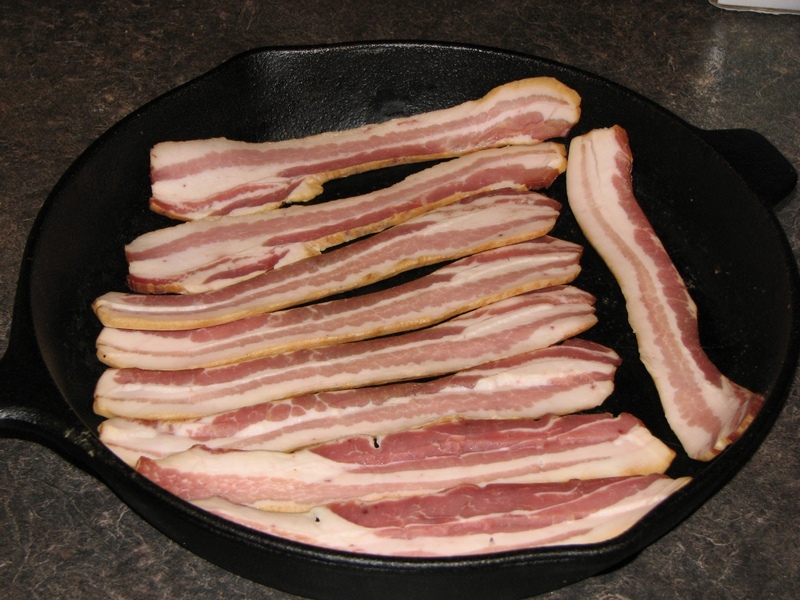 I also put some bacon in the cast iron, as I was going to be making the neighbors all drool with aromas of charcoal, bacon, onion and burgers wafting through the cool evening winter air… nothing smells as good as a BBQ in the winter!!! So the onions went on first as they need some time to caramelize without getting totally charred. 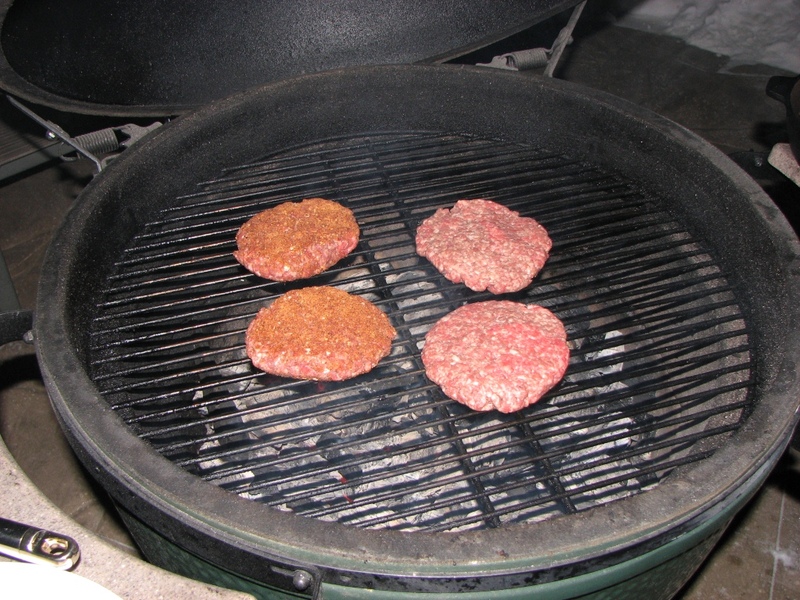 Then I took the onions off and cranked the heat a little to sear off both sides of the burgers for about 6 minutes. 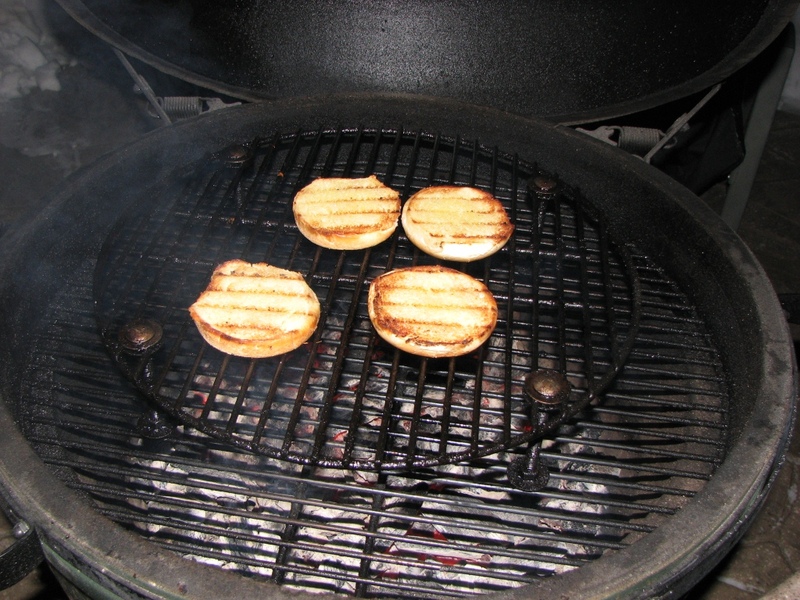 What I love about the BGE is that unlike gas grills, you really don’t get the same kind of flare ups because you control the oxygen. 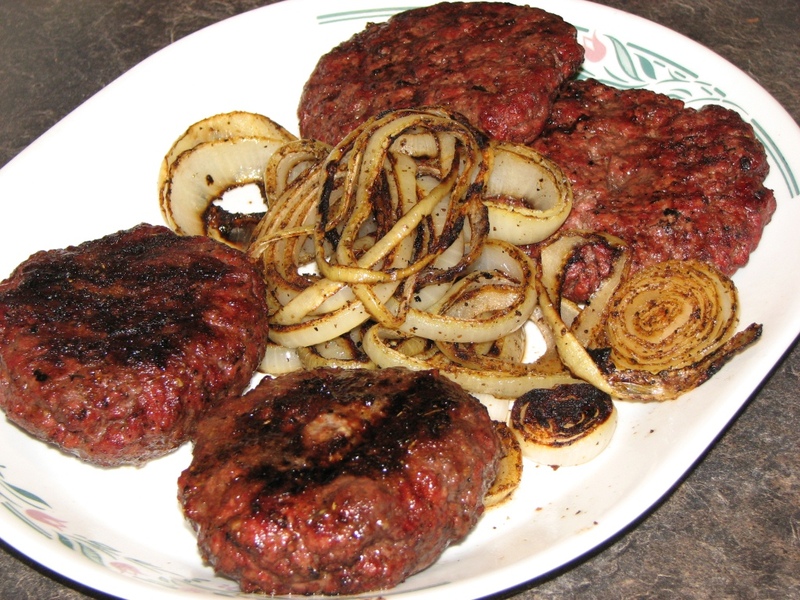 Plus using ground chuck roast from the butcher was better than using ground mystery meat from the supermarket! 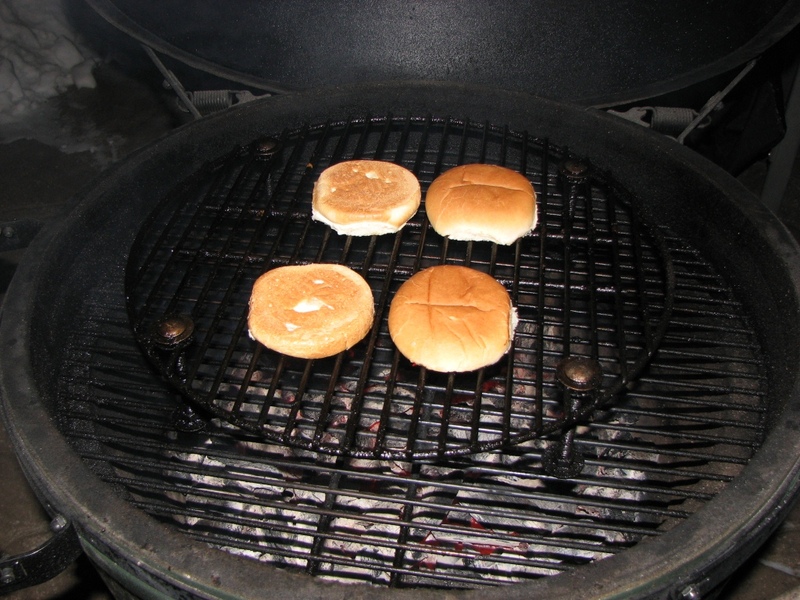 After 6 minutes I took the burgers off and got set up to cook the bacon. 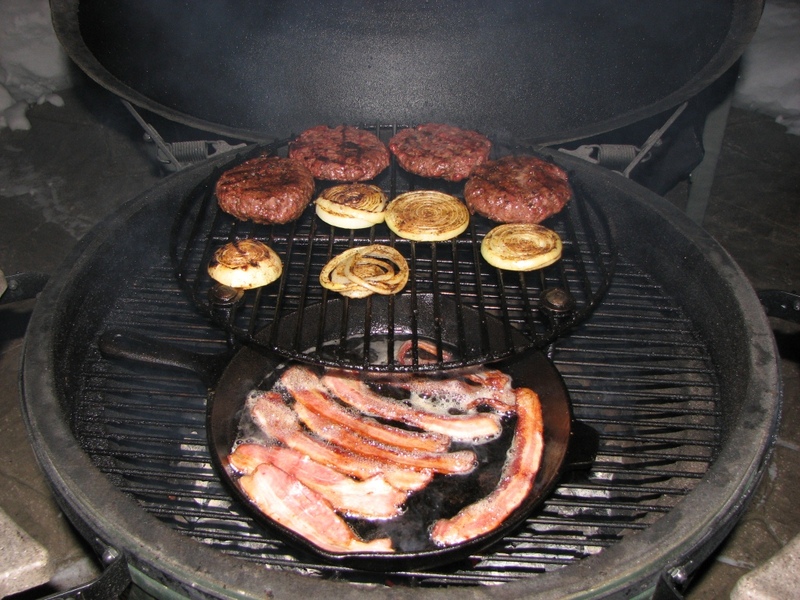 I put the cast iron on directly and then put my raised grid on above that to finish cooking the burgers and onions higher up in the dome. 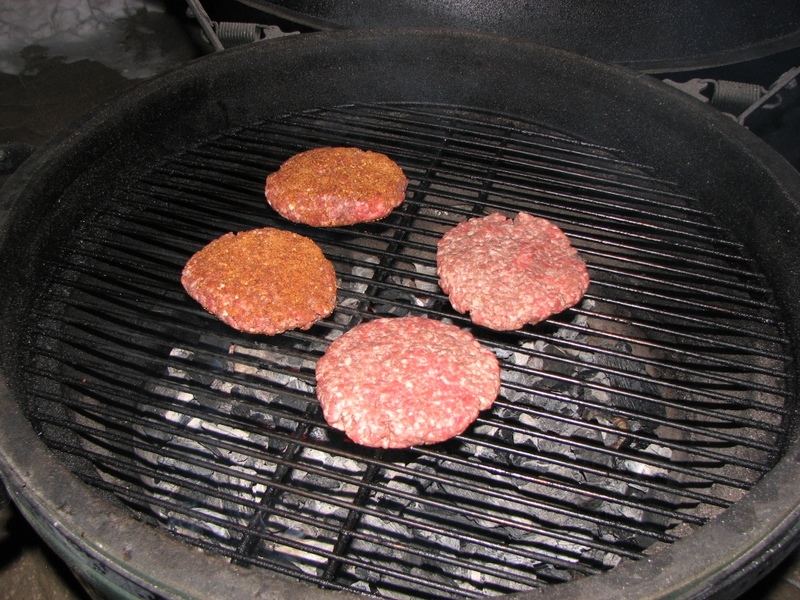 I also hit the burgers with a little Worcestershire Sauce at this point. Oh man… if only you had smellivision! Mmmmm Mmm that IS a tasty burger! 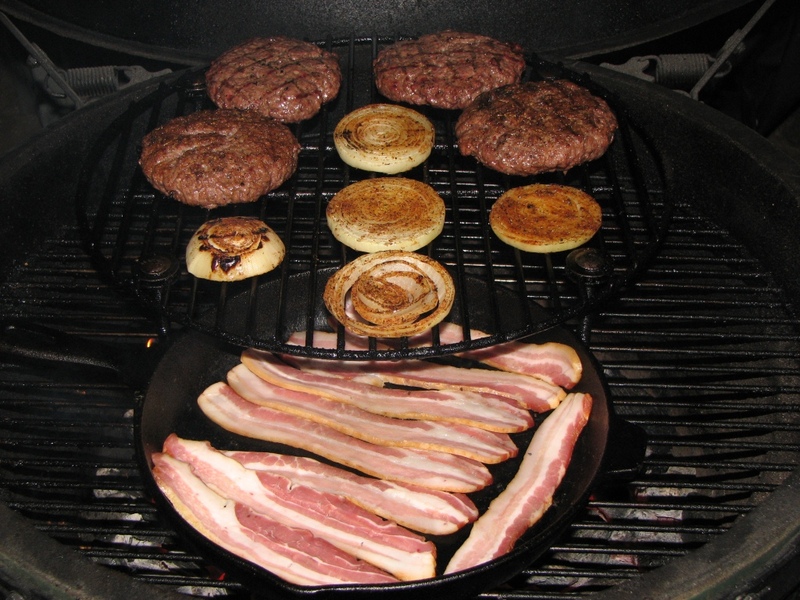 I like the multi-layers of the grill, great looking burger. Thank!!! Made the raised grid myself, (see a couple of posts back earlier this week for instructions). 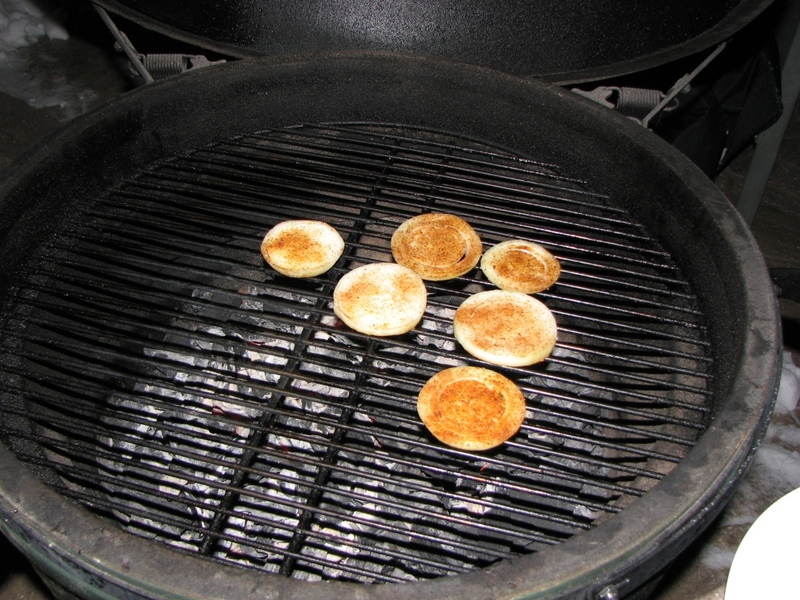 It works great to get things higher in dome and away from the coals so they don’t burn. I caught that a couple days ago, I am in the market for a new smoker, was leaning towards the pellet grills but will definitely check out the egg. 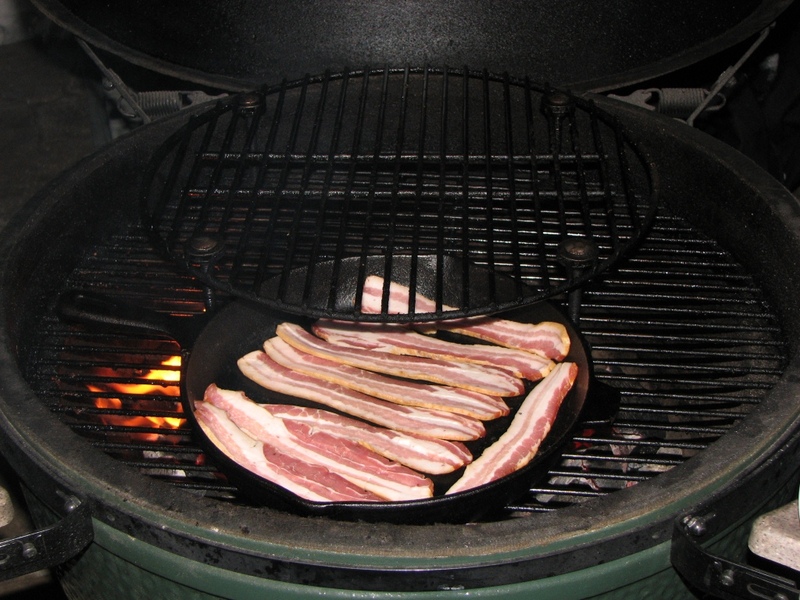 You might get a better, more intense smoke with a pellet smoker, but the BGE is so versatile that you can smoke on it, plus do high temp searing, baking and grilling. I am vey happy with my Eggs! This sounds delicious. 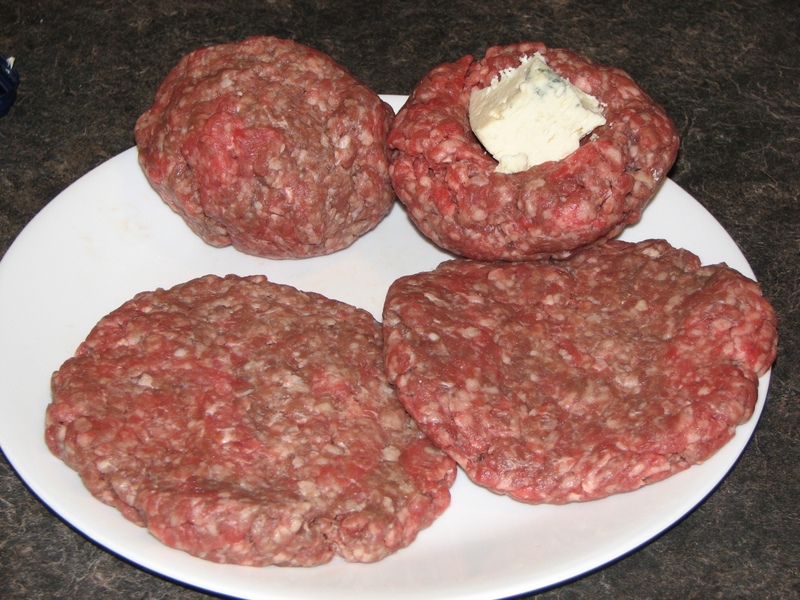 I never thought to put the blue cheese in the middle of the patty when forming them. I am making these this week. Thanks for posting the recipe. Thanks for reading! 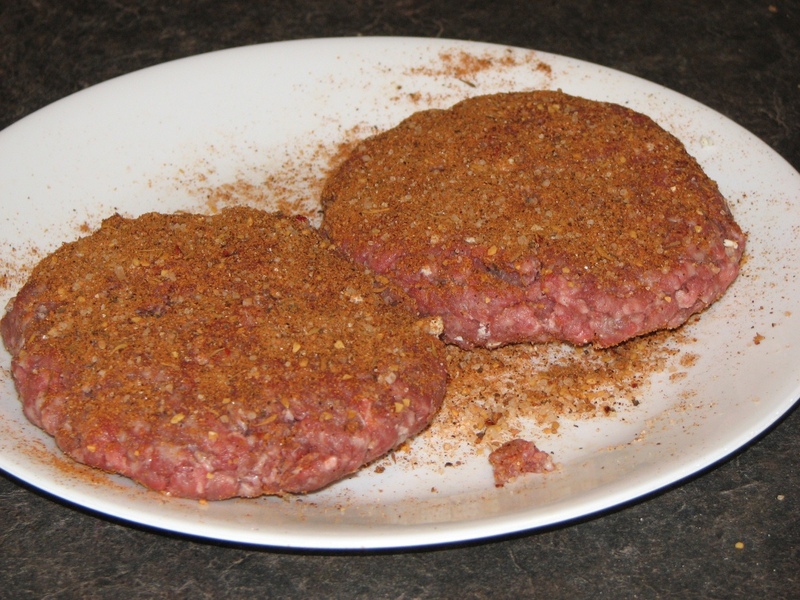 I found that when stuffing the blue cheese, if you smush it up in your hands a bit first to soften it, it makes the patty easier to form… But it all depends on the softness of the cheese to start with. I also put the burgers back in the fridge to set up. There was no filler either, just beef and cheese. Good luck with your burger! Thanks for the additional tip. Maybe I will let the cheese get closer to room temperature then before I add it to the patties so that it would be softer and make it easier to form. Forget Smellivision – just the photos are making me drool! 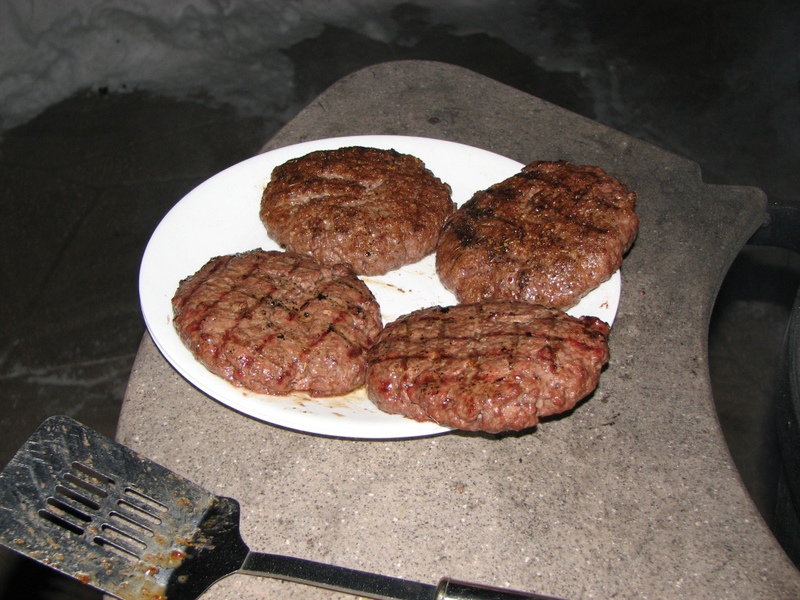 A local butcher where we used to live sold burgers he made up himself – cheddar and bacon, blue cheese, etc. What a treat on a fresh bun. We were so sad when he closed. I love that we have a butcher that opened in walking distance. I get most of my meat from them now. Way better than the big supermarkets. Has a much better flavour, especially the beef. Thanks for reading! Awesome! Check out the spider from ceramic grill store. If you already haven’t. Drops the great closer to the coals. I use it with a homemade CI grate. That’s only way I cook steaks and burgers anymore. I have a wok and want to do some woking as well. I cook a mean general chicken. Ceramic grill store is where I got my spider.